I'm finally getting started with my gel reviews. 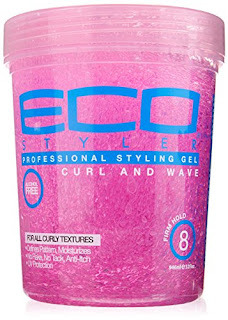 There isn't much to say about Eco Styler Pink. I love it and use it frequently for wash & go's. It is the only gel currently on my staples list. 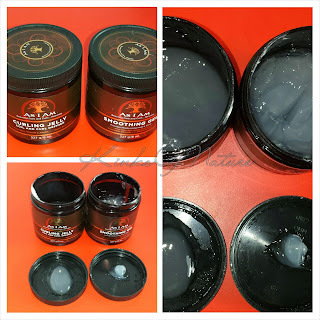 Ingredients: Water, Carbomer, Hydrolyzed Wheat Protein, PVP, Glycerin, Tea Tree (Melaleuca Alternifolia) Oil, Chamomile (Anthemis Nobilis) Extract, Calendula Officinalis Extract, Echinacea Angustifolia, Centella Asiatica, Triethanolamine, Sodium Hydroxymethylglycinate, Polysorbate 20, Tetrasodium EDTA, Fragrance, D&C Red No. 33. Thoughts: Eco Pink is "an anti-itch formula, ideal for scrunch waves, with no flakes or tack". My scalp itches while its's drying, but it usually does with any product. I avoid this by applying product an inch away from roots. There's no flaking though. I'm not sure what they mean by tack, but I'll assume sticky, and I don't get that either. Out of all of the gels I've tried so far, it is my favorite. It works with every leave-in and conditioner combo I've used. It goes on easily and isn't too thick or sticky. I prefer to apply it by rubbing it in my hands, adding water, and then smoothing it into my hair followed by scrunching. It gives a nice hold and isn't drying. I get 5-day hair when I use this. Eco Pink has a light fruity-floral fragrance, which is more pleasant that Eco Olive. I don't remember the fragrance for Eco Argan so I can't compare the two. My only issue with this is the jar. It's inconvenient for use in the shower, which is where I usually apply products. Water gets in the container and spilling is always a risk. Eco Styler Pink is available at drugstores and online retailers in a range of sizes (8oz-5lb) with prices ranging from ($1.99 to $10.99).